Stuart Eve thinks that to really understand what it was like to live in the past, you have to see it for yourself. And you have to hear it and smell it, too. Eve is an archaeologist working on something like a low-budget time machine. A few years ago, he made a prototype for an augmented reality app called Dead Men’s Eyes, which he fashioned to get a close look at prehistoric life in Leskernick Hill, a tin-mining village in southeastern England. As he walked the site, Eve could look through the camera feed of his iPad and see virtual Bronze Age houses that were invisible in the modern landscape. Depending on his GPS location, the app would play different 3D audio (a crackling fire, muffled voices) in his headphones and trigger different smells (animal manure, smoke) to be emitted from a device hanging around his neck. Now, Eve wants to create the same type of immersive experience for Waterloo Uncovered, a new archaeological project at the site of the bloody 1815 battle that marked Napoleon’s defeat. To be a good archaeologist you need an active imagination. You need to see a roaring hearth where there’s just a faint circle of ash in the dirt. You have to picture an ancient kitchen amid a scatter of broken pots and butchered animal bones. And, in the case of Waterloo, you need to imagine some 50,000 stinking dead and dying men battling in an idyllic Belgian field. Luckily for the rest of us, archaeologists have new tools to stoke imaginations. They’re experimenting with virtual reality and augmented reality to bring ancient and historic sites back to life. Right now, Levy isn’t so concerned with resurrecting lost archaeological sites, but rather digitally preserving ruins before they’re lost. As director of the Center for Cyber-Archaeology and Sustainability at the Qualcomm Institute, he’s leading a project to compile and visualize 3-D data from at-risk sites around the Mediterranean and Middle East. In 2015, Levy’s team used ground and aerial photography to capture 3-D images of Deir Mar Saba, which dates back to the 5th century and is the largest monastery in the Judean desert. The importance of this type of documentation became clear to Levy when, about six months later, ISIS destroyed a similar Greek Orthodox complex, the St. Elijah monastery in Mosul, Iraq. Levy’s team is making their images of Deir Mar Saba compatible with VR so that the public can explore the site using an Oculus Rift or trying the immersive VR CAVE kiosk just installed at UC San Diego’s Geisel Library. Behind the scenes, the Qualcomm Institute also has several VR interfaces with which archaeologists and other researchers can step inside shipwrecks or dig sites in ways that would otherwise be physically impossible. Even in you’re not a scientist, there’s a growing library of places to explore from your couch with a VR headset, or just a Google Cardboard and a smartphone, thanks to commercial developers. A Melbourne, Australia-based startup called Lithodomos recently released an Ancient Jerusalem app that lets users see what Herod’s reconstructed Temple looked like in the first century A.D., before much of it was destroyed. You can also explore the Game Pass shelter, known as the “Rosetta Stone” of South Africa’s rock art, with a new VR app from the Glasgow-based company Soluis. Seeing opportunities to educate and attract new visitors, museums are getting in on the VR game, too. 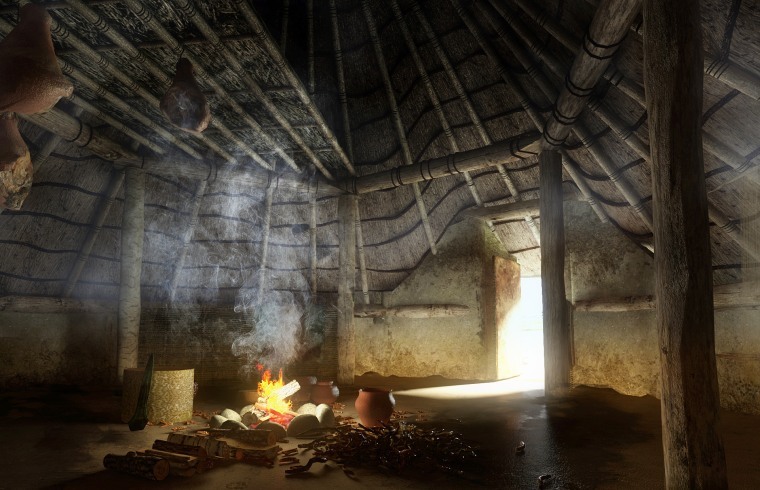 The British Museum in London, for instance, partnered with Soluis to digitally recreate a Bronze Age roundhouse for a VR weekend in 2015. By stepping inside an immersive dome or putting on a VR headset, visitors could walk around the fire inside a 4,000-year-old house, inspecting swords and other objects they would otherwise only encounter behind glass in the museum. Another VR exhibit in Beijing’s Forbidden City takes visitors through reconstructions of the porcelain factories during the Ming and Qing dynasties. To transport visitors into a more recent past, the Royal Canadian Regiment Museum in Ottawa partnered with VR company SimWave to make a rumbling rig that recreates being down in the trenches at the Vimy Ridge battle during World War I. Some see the most promise in experiences that go beyond the visuals. “For my money, the most useful stuff is not the VR, at least not yet, but the augmented reality,” says Shawn Graham, a digital archaeologist at Carleton University in Ottawa. Augmented reality (AR) and other forms of mixed reality use VR elements overlaid on the real world — think Pokémon Go and Google Glass. Simulations that can fool your other senses — like 3-D audio to trick your ears or gloves to mimic touch — make for a more effective immersive experience, as sight is just one way we perceive reality. Eve, however, notes that AR technology isn't quite ready to be a massive hit. He’s waiting to see what companies like the Florida-based AR outfit Magic Leap come up with in the next few years. But whatever form the VR and AR experience takes, the story is key. “I think we make a mistake if we imagine that augmented realities or virtual realities are something brand new in the world,” Graham says.